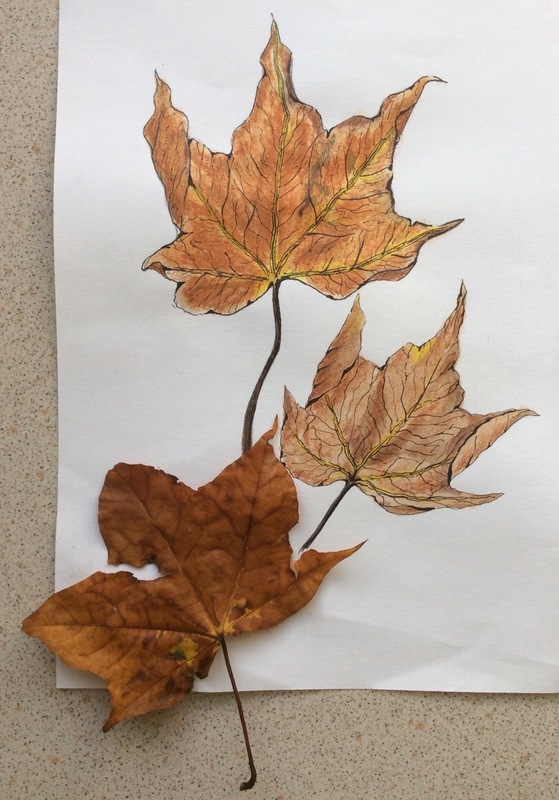 A few days ago prolific artist Laura, from Create Art Everyday, blogged about a challenge she is taking up which involves painting a leaf everyday for a month. You can read about the challenge and where it originated here. I liked the sound of this so I thought I would have a go…..I don’t do painting so this is a real challenge for me! Last night saw my first attempt, fortunately I painted two leaves which I hope makes up for not having made the time to do one today! My idea is to use this challenge to create a “leaf” sketchbook which in turn can be used as a resource for making more Tyvek and Lutradur leaves. I’m not convinced I can keep up with painting every day but I will do what I can and hopefully I might see an improvement in my painting by the end of the month! Oh this is absolutely lovely! Love the vein work and the way you drew the curls in your leaves. Thanks BB, your very kind. I was so pleased to discover your site through Laura, your artwork is wonderful and your challenge is certainly keeping me busy! Today’s leaf is almost finished but I’m not happy with it so must try harder tomorrow! Karen, these are beautiful, so delicate and intricate! Not to mention the Tyvek & Lutradur leaves – you are so talented! I’m so glad you’re joining us in this leaf challenge. I look forward to a terrific month ahead! Thanks Laura. It’s a really nice idea for a challenge and I hope you get the time to play with your Lutradur – looking forward to seeing the results. Thanks, Karen. I’m really enjoying that leaf challenge – much more than I thought I would. Really glad you joined in, as you clearly have a gift for leaves in many mediums! How did you learn about Lutradur, or did you just experiment on your own? Any books you could recommend? I think it may have been in a Margaret Beal book called New Ideas in Fusing Fabric, or Three Dimensional Embroidery by Janet Edmonds. Janet’s book was the one that inspired my Tyvek leaf, it’s full of fantastic images and info. Do you use the Colouricious website? There is some interesting stuff on there including Lutradur here. So much to do, so little time…….! Have fun! Thank you, never heard of these! I appreciate the references!